A 25-year tradition of excellence is extended in the Fourth Edition of this highly regarded text. 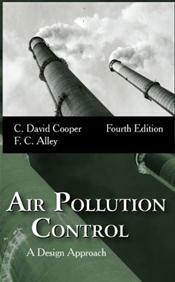 In clear, authoritative language, the authors discuss the philosophy and procedures for the design of air pollution control systems. Their objective is twofold: to present detailed information on air pollution and its control, and to provide formal design training for engineering students. New to this edition is a comprehensive chapter on carbon dioxide control, perhaps the most critical emerging issue in the field. Emphasis is on methods to reduce carbon dioxide emissions and the technologies for carbon capture and sequestration. An expanded discussion of control technologies for coal-fired power plants includes details on the capture of NOx and mercury emissions. All chapters have been revised to reflect the most recent information on U.S. air quality trends and standards. Moreover, where available, equations for equipment cost estimation have been updated to the present time. Abundant illustrations clarify the concepts presented, while numerous examples and end-of-chapter problems reinforce the design principles and provide opportunities for students to enhance their problem-solving skills.